One of my typical disclaimers when I teach bellydance, even before I lead anyone through a warm-up stretch, is as follows: “I am not a medically trained professional. Please do not make me take you to a medically trained professional. Listen to your body and only do what *your* body will allow you to do today.” Paired with my teaching motto, “No Pressure, No Shame,” I will not pressure you to do more than you can physically, safely do. Nor should anyone feel any pressure from anyone else in the class. Likewise, I encourage everyone to heed this advice for their own internal monologue. Please do not shame yourself. Now, I may ask you to stretch your current abilities as best as you are able, but never with pressure and never with shame. And never to the point that I should have to take you to see a medically trained professional. So. Time to take my own medicine. Time to listen more carefully to my body. And never to pressure myself and NEVER to shame myself for acknowledging where *this* body, *today*, can take me. Today, I can do two things new. I can turn my neck to the right (yay! tiny internal victory dance!). And today I was able to lie flat on the bed with a pillow under both shoulder blades, stretching both arms out to my sides (as if my arms are top bar of a T and my torso is the center vertical line). That’s new. I couldn’t do those things yesterday. Actually, I couldn’t lie flat on my back at all yesterday. So yay me. And here comes the tough thing: Encouraging myself to still rest, relax, stretch slowly so that my body will *continue* to recover and rebuild properly. Have you ever had a tiny muscle spasm in your eyelid or on your face? I can feel tiny spasms like that in the lateral portion of my right deltoid. Yesterday’s major pain seemed to be centered in both the posterior portion of right deltiod as well as the entire trapezius. (Note: All these medical terms are courtesy of google, wikipedia, and image searches. I had no idea what to call each of these, only ten minutes ago). My trapezius has relaxed considerably. The deltoid now just twitches intermittently. And I feel human. What a difference a day can make. And how thankful I am for modern medicine and the medically trained professionals in my life. I’m positive I’ll need to see a physical therapist of some sort to learn the proper way to strengthen these (and other) muscles so that I actually have recovery and preventative stretching and strength. Thank you all for your supportive emails, texts, tweets, comments, posts, prayers, and warm thoughts. I don’t feel so alone. 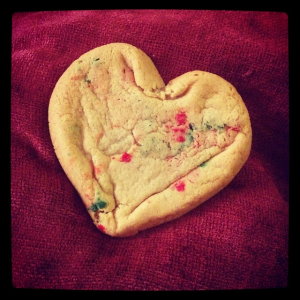 For you all, I send virtual love cookies. Edited Note on Monday: A new muscle name for me today: Brachioradialis… the “I’m picking up my coffee cup and that hurts” muscle. I’ll need to heal and strengthen my traps, deltoids, and brachioradialis muscles. Fun.